Despite being the most visible component of any PC build, finding the best PC case often gets low billing during construction. More than one enthusiast builder has stuffed all the components into their shoddily chosen case and found that the thermal profile is totally untenable, or that cable management and upgradeability are an absolute nightmare, assuming, of course, you can even pack the best graphics card or the best CPU for PC gaming into the case they've chosen at all. A great case isn't just the home where your parts live, it's also important to ensure proper ventilation and cooling, and as the outward facing shell of your machine, is the most vital choice for determining your PC's overall aesthetic. Our number one case for PC gaming is already pretty modestly priced, so shaving another $9 off makes it pretty irresistible. It's tool-less design can also be stacked with another identical case to separate components for ease-of-use and upgrading. So where do you begin when you're trying to find the best PC case for your build? The first and most obvious hurdle is getting an appropriately sized case to fit all your components inside, and still have enough room left over for proper ventilation, whether that's a full tower, mid-tower, or mini-ITX. Next, you'll want to consider what kind of fans you want built into the case itself, and also whether or not you want it illuminated by fancy RGB lighting. If you do, you may also prefer a case that sports some tempered glass, to show off that rainbow of colored light, though if RGB isn't appealing to you, traditional aluminum paneling tends to be less expensive. Finally, you'll want to consider the cases feature set - some modern cases include fantastic systems to help with cable management, or even dual chambers to isolate components, and toolless access to ensure building and upgrading is a breeze. If all of this buying and building is beginning to sound like a chore, you can just jump ahead and consult our best gaming PC roundup to save yourself the trouble. You'll also want the best gaming keyboard and best gaming mouse to accompany your new machine. And for a breakdown of some of the more complicated terms surrounding modern PCs, check out our hardware glossary. Glance at a checklist of must-have features for a gaming PC case and you’re unlikely to find “stackable” listed on there. But that’s exactly what the Thermaltake Core V21 brings to the table. This impressively customisable little cube can be combined with its brethren for split designs - one half housing your motherboard while the other is dedicated to liquid cooling, for instance. Symmetrical panels and modular fan rails and drive mounts allow for a variety of configurations, with the relatively tool-less design helping you to achieve them with ease. The V21 still has a lot to offer for those without Franken-PC aspirations, too. Large ventilated panels with magnetic dust filters help keep its innards cool, as does the large front 200mm fan. The only downside of this airy design is a lack of noise absorption. If you’re really wanting to scrimp, this even cheaper offering from Thermaltake provides ample space for most m-ATX and mini-ITX builds. The Corsair Carbide 280X is a successor to the popular Air 240. While sporting a similar form factor, it boasts a slick new design with three tempered glass panels. The regular 280X is reasonably priced for such a solid, attractive chassis, though you’ll likely be tempted to stump up the extra for the RGB SE variant (pictured). This includes two RGB 120mm fans for fantastic rainbow lighting, albeit via Corsair's proprietary iCUE software. What's smart about the 280X is its incognito secondary chamber in which you can hide the PSU, storage drives and - most importantly - the cabling. While you won't receive the best cooling performance from the stock fans, there's room for water-cooling radiators at the front and top of the case. The Phanteks Enthoo Evolv offers great cooling capabilities and looks smashing to boot. 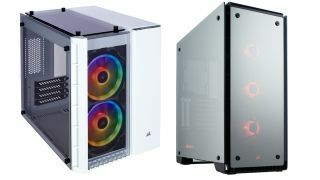 The NZXT S340 mid-tower case was popular for its clean, minimal design and enticing price tag. The H500 revamps this old favourite with a new tempered glass side, increased air intake and other design tweaks. While airflow still isn’t the best due to the solid front, it’s adequate for many builds. The H500’s steel cable management bar and PSU shroud are a godsend for keeping things tidy. This case’s thoughtful design and solid build quality are a pleasant surprise given its reasonable price. This budget hero is smart and understated, and comes in a range of new colours. Splash out a little more for the H500i and you’ll receive smart cooling features and two RGB LED strips, plus the option to mount your GPU vertically. Looking for something even cheaper? The CR500 from Riotoro offers a solid feature-set at a remarkably low price. Take a look at the Corsair 570X and it's hard to not to fall instantly in love. This stunner is covered in panels of tempered glass and features three RGB fans for a show-stopping display of your rig’s interior. Check out the Mirror Black variant for a reflective surface that reveals all when powered on and lit up. The 570X isn't just a pretty face, either. Glass can be risky for heat but this case is well ventilated with room for six fans and all manner of cooling systems. Full top-panel and face-panel filtration helps keep out dust, the bane of a cool machine. The only disappointment is that cable management is sub-par for such a revealing case. Another marvel of luxurious tempered glass and customisable RGB fans, the Corsair 500D RGB SE is a sight to behold. Lastly, here are the best gaming laptops... in case you don't want to build a PC after all! A big case doesn't have to mean big money. The Phanteks Enthoo Pro Glass has enough space to swing a cat inside - or at least a very large GPU - without costing the earth. It doesn’t feel like a compromise, either. This case is solidly built and looks the business thanks to a sleek black exterior with tempered glass side panel. One of the Enthoo Pro’s deceptively premium features is tool-less, modular drive bays. Whether you’re prioritising storage or making space for your components or cooling it can be tailored to your needs. Handy cable routing options and Velcro straps ensure that however it’s built, it’s tidy. Thanks to its size, this chassis has both great airflow and space for multiple radiators and fans. Only a front intake and rear exhaust fan are included, but there’s space for up to four more. Admittedly, the Stryker SE leans more towards the mid-range in pricing but this Stormtrooper-esque goliath offers a lot of interior space for your cash. Install the best DDR RAM for gaming. Gaze upon the best gaming monitor. Feel the best gaming keyboard. The Cooler Master Cosmos C700P is an ode to excess, pushing boundaries in size, style and customisation - as well as in price and weight. This brushed aluminium brute sports curved tempered glass in a design that wouldn't look out of place on a spaceship. The C700P’s standout feature is its modularity. With cutouts and frame rails on all sides you can mount your motherboard and components in any orientation imaginable - even on the opposite side of the case, switching side panels to match. Needless to say, there's enough room for extensive cooling configurations too. Carry handles let you take the C700P with you, provided that you're strong enough to lift it. Its cool gunmetal grey exterior is something you’ll want to flaunt, after all. The only letdown is the stingy default storage bays allowing just one SSD and two HDDs. Another highly modular option. This revamped model sports a range of upgrades to an already attractive full tower chassis.